Is Intercom expensive? Save hundreds of dollars on your Intercom bill each month! Intercom is a great software, no doubts about it. But its 'by active user' pricing can make it really expensive. Particularly for startups getting some traction and having multiple thousands new 'active' users in the pipes (we know what we're talking about). The good news is that by archiving active users, you can drastically decrease your Intercom bill. Drastic like in several hundred dollars off. How can I save on my Intercom bill? It's easy: At Phantombuster we build automations that do specific actions on your behalf on the web. In this case, we're connecting to your Intercom account, archiving every user that's been inactive in the last 4 weeks and send you an email with the results. That way, you're always paying for the lowest plan you need. And if you schedule this automation, we'll do it for you every month. With our Free Forever Plan, it's free. To show you that automations doing the right actions at the right times have tremendous potential upsides. We hope this we'll be a gateway for you to use our other automations. This automation will connect to Intercom on your behalf. The safest and most efficient way for Phantombuster to authenticate as yourself is by using your session cookies. The goal of this section is to specify who you're going to archive. 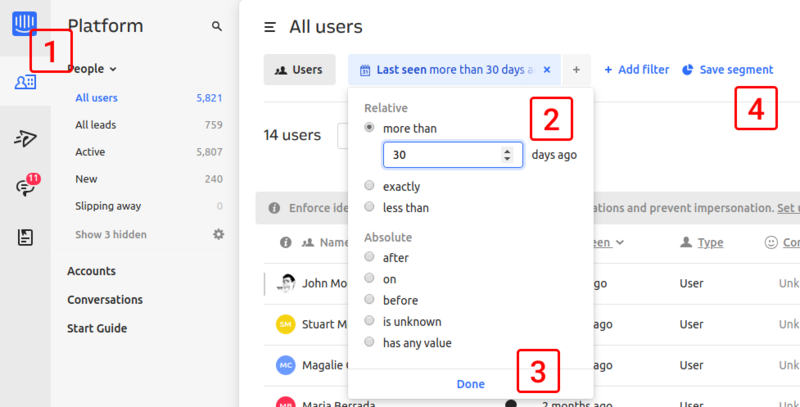 The criterion is usually days since last activity on Intercom and we recommend using 30 days by default. But if you wish to specify a very specific segment, you can do it by creating your Intercom segment. Intercom segments are groups of users fulfilling specific criteria. Create the exact segment of users you want to archive and let Phantombuster know its ID. Once is cool, but repetition is where the value lies. We recommend you schedule it to launch every month. This API will ask Intercom to export your archived users and send them to your inbox. That way, if you happen to need to reimport your users, you can!